DewPoint Hygrometer displays the dew point, air temperature, and relative humidity at your current location. The app is launched by a long press in the main window, and "Updating..." will be indicated in the status bar at the top of the screen. DewPoint Hygrometer establishes your location from GPS satellites, and then obtains the meteorological information that applies at the relevant co-ordinates. 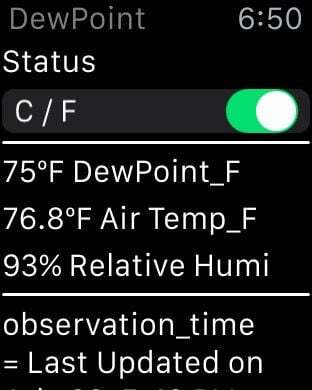 The display format for the retrieved information is: "observation_time, weather, wind_string, pressure_mb, feelslike_string, visibility_km, solarradiation, UV level, precip_1hour, precip_today". More Swipe to right, back to the Main Windows.